Save some green by going green with these environmentally friendly gadgets! With concern for the future of our environment growing stronger and more serious every day, there has never been a better time to take a new approach to some of the most popular gizmos and gadgets on the market and learn how you can convernt to electronics that have minimal environmental impact. Green gadgets encompass everything from iPods to energy-efficient home entertainment devices to solar laptop chargers and crank-powered gizmos. 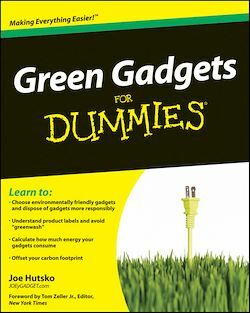 This helpful resource explains how to research green gadgets, make a smart purchasing decision, use products you already own in a more environmentally friendly way, and say goodbye to electronics that zap both energy and money. Get tips for understanding products labels and avoiding "greenwash"
Get moving and start living green with this informative guide to environmentally and wallet-friendly gadgets!